The latest iteration of GraniteGrok.com is up and running. We’ll admit that we were going to wait a few more days, but something happened on 2.0 that made us wonder if that site, an old style with old security, had been compromised. We opted to go live and debug on the fly. Now that we are here I thought I’d take a moment to walk you through the layout. First, Hot on the Grok sits at the top of the home page and shows the posts that currently have the most hits or views. So, this changes based on where our readers are spending the most time. Below that is new content. The ten latest posts, followed by the twelve that preceded those. New Layout, lighter more open look. The right column will include more features down the road (widgets with players and live-stream viewing options, as well as our events calendar). As of today, we have the Daily ‘Grok sign up. Below that is the New Media Militia widget. A short while back I experimented with a website called the New Media Militia (NMM). The idea was (still is) to curate New Media content from around New Hampshire created by Republican, Libertarian, and Conservative writers, vloggers, and podcasters. There wasn’t enough new content to keep that beast fed, so I had to expand it to include news and other sorts of content. I stopped updating that site last spring with a plan to integrate the idea into the next iteration of GraniteGrok. 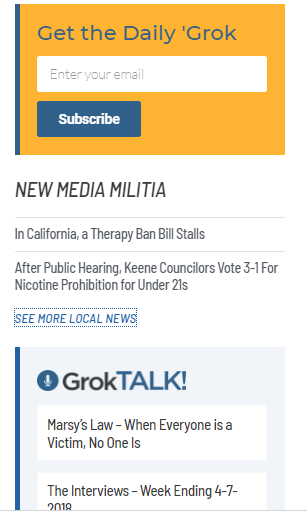 The New Media Militia feature on GraniteGrok.com will fulfill the original plan. 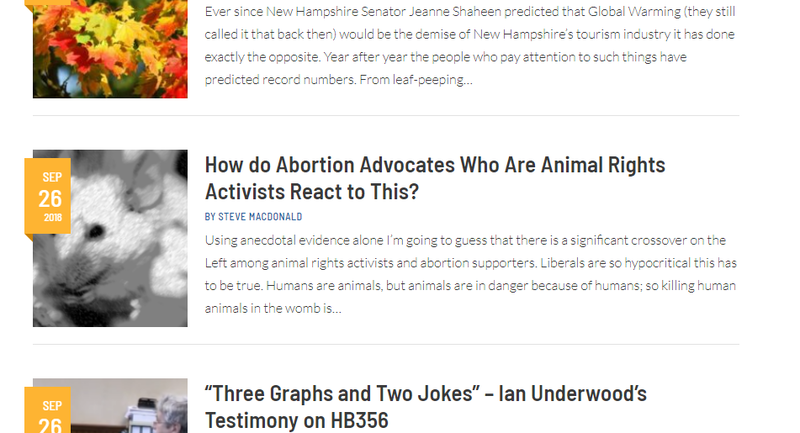 Provide links to content by Republican, Libertarian, and Conservative writers, vloggers, and podcasters from around New Hampshire. This widget will (eventually) show five links on the home page. Select “see more local news” to go to the dedicated NMM page where you will find all the local links we have shared. There’s not much there yet but these links take you to the content creators source page. You also see a GrokTALK! episode feature which has the most recent published podcasts. This title is changing to ‘What we are reading that we have not had time to blog about,’ or something similar. It is a repository for links to content that caught our eye. We may or may not find time to blog about it later but either way, we wanted a place to share that in case we never got around to fisking it. This feature will show the last six videos published by GraniteGrok including recorded streaming events, or video content we produced or shared. Select Browse All video so go further back in the catalog. You also see a duplicate of the email sign up and the most popular posts from the top of the page in a different format. Much like the side column widget, this shows the last handful of published content. 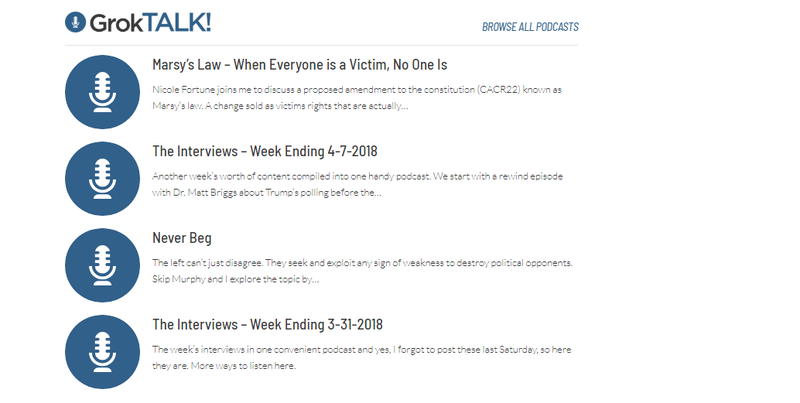 Browse all podcasts takes you to the dedicated GrokTALK! Page. That’s it for the home page, for now. There will be tweaks as we go along so look around when you stop by and be sure to pull us up on your smartphone; the mobile experience has changed as well. And as always, thanks for reading (listening, watching, commenting, and sharing).